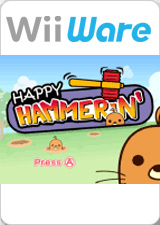 Happy Hammerin' (たたいて!モグポン) is a party game suitable for friends and families to compete against each other by bashing moles using the Wii Remote controller! Swing the Wii Remote controller like a hammer and let off some steam as you frantically try and bash the moles popping up all over the screen. Play against the CPU or go head-to-head with up to four players. Players can challenge themselves in three different modes: Mole Adventure (1-2P), Mole Marathon (1P) and Party Battle (1-4P). Mole Adventure consists of 4 stages with 3 difficulty types. The faster you bash, the more points you get. Register your scores online and compete against the best mole bashers from around the world. The graph below charts the compatibility with Happy Hammerin' since Dolphin's 2.0 release, listing revisions only where a compatibility change occurred. This page was last edited on 24 January 2018, at 02:17.